I have something I need to get off my chest…okay, here goes: I have trouble ‘letting go’ of my plants. There, I said it. Whew. What I mean is, sometimes ‘weeds’ come up in unwanted places in my garden, but I can’t bear to just chop off their little heads. I either dig them up and pot them, or leave them in situ. 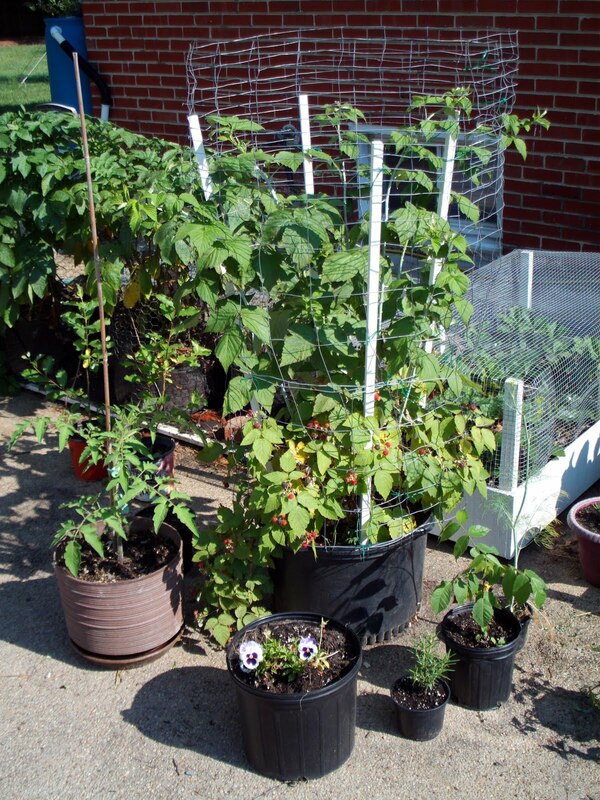 Each of the tomato, raspberry, rosemary, and walnut in the pots in the foreground came up all on their own. The pansy was in a window box in which I wanted to plant petunias for the summer since the pansies already resident in them didn’t look so good. Still, the pansies weren’t dead yet, so I transplanted them to live out the rest of their natural life while I put in the petunias. The tall dill plant on the left came up on its own this year, as it did in several areas of my garden and also in cracks in my driveway. I’ll use it for my pickling in a few weeks. 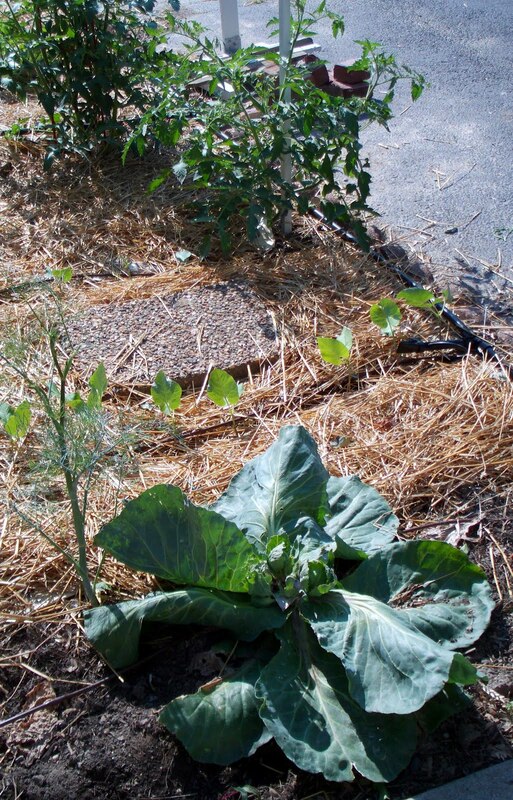 The cabbage head to the right was picked a few weeks ago. But then it started to grow little mini-heads on it (kinda look like Brussels sprouts), and so I wanted to see what would happen. Fear not, though, as I just planted some pumpkin seeds in the vicinity which will soon take over the area. Exhibit C: You know when the little seed packets tell you to ‘thin out’ your seedlings once they’re a particular size? Well, usually I carefully dig them out and either transplant them, or put them in a small pot to give away or plant later. A few weeks ago I had 5 lovely zucchini plants on each hill, and I dug up two from each hill and gave them away at work. I didn’t think to get a picture of them at the time, but why waste perfectly good plants, I say! 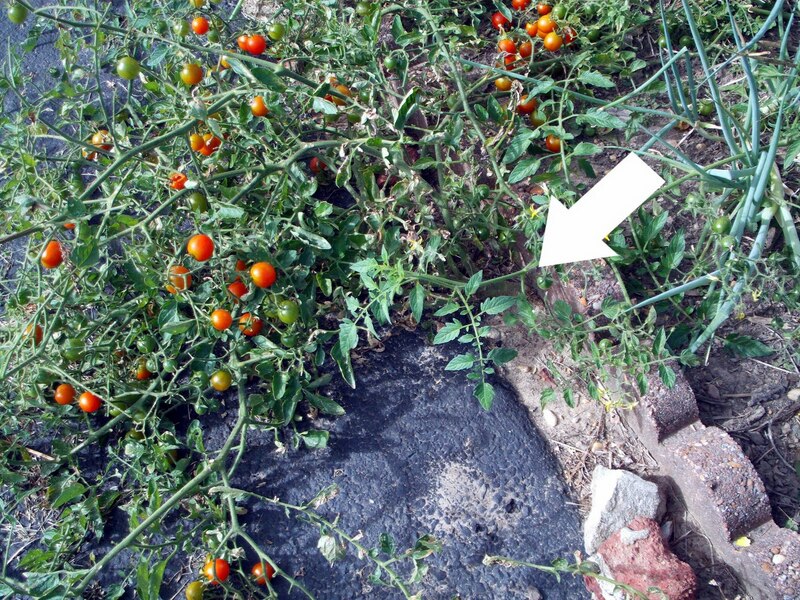 Exhibit D: I never planted this cherry tomato plant last year, but it was probably the most prolific (and disease-free) cherry I had. Didn’t look so swanky in the middle of my lily patch, but what was I to do? I didn’t have room elsewhere, and I don’t have a Homeowner’s Association breathing down my neck. These are but a few examples of my garden shenanigans. I’m curious, can anyone else identify with this phenomenon? Tell me I’m not alone here!